Before we get started, yes, it’s noisy! We are an urban, historic, rock ‘n’ roll hotel. Your room may be affected by plaza, nightclub, or street noise.If you would like to stay in one of our quieter rooms, please make arrangements at the time of your reservation. We do not give discounts or refunds due to noise. Earplugs are available at the front desk. Or, better yet, just join in the fun! Stay with us at Hotel Congress during Agave Heritage Festival and save 10% off any of the festival events! Room rates start at $109. Book your room online or by calling the front desk at 520-622-8848. Stay with us on any weekend nights* during Agave Heritage Festival and upgrade to our Festival Room Package which includes a limited edition Hotel Congress Centennial Tote Bag, a large authentic Mexican serape, a commemorative shot glass, and a box of mezcal bonbons from Monsoon Chocolate! Unique Southwestern charm, urban and vintage. The Hotel Congress, built in 1919, is the cultural landmark that anchors Downtown Tucson. Though classically renovated and updated, every nook and cranny of the hotel reveals a window to years past, from the Tap Room Bar to the colorful murals that line the walls – there is a story in every detail. Our Hotel Congress Happy Hour is available Monday – Friday from 4-7pm in the Lobby and Tap Room bars. Our Bar Eats menu is available only in the Lobby Bar, Tap Room, and Plaza, Monday – Friday from 4 p.m. to close and on Saturday & Sunday from 4:30 p.m. to close. We pride ourselves on the many unique features we offer that youʼd be hard pressed to find anywhere else. Some cynical city slickers might notice the absence of a television in any of our 40 rooms and feel slighted. But itʼs intentional. 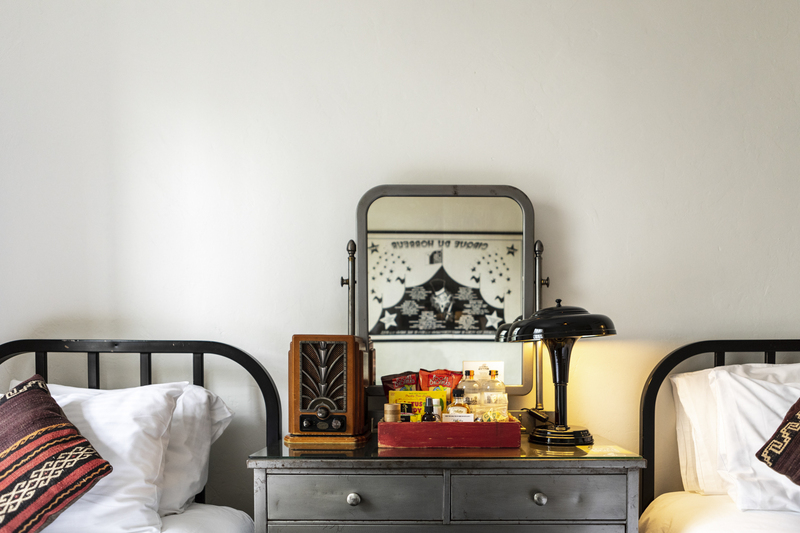 We strive to maintain the hotelʼs original ambiance from the iron bed to the vintage radio, the rumble of the nearby train to the 1930s-style phone that connects to a real switchboard at the front desk. 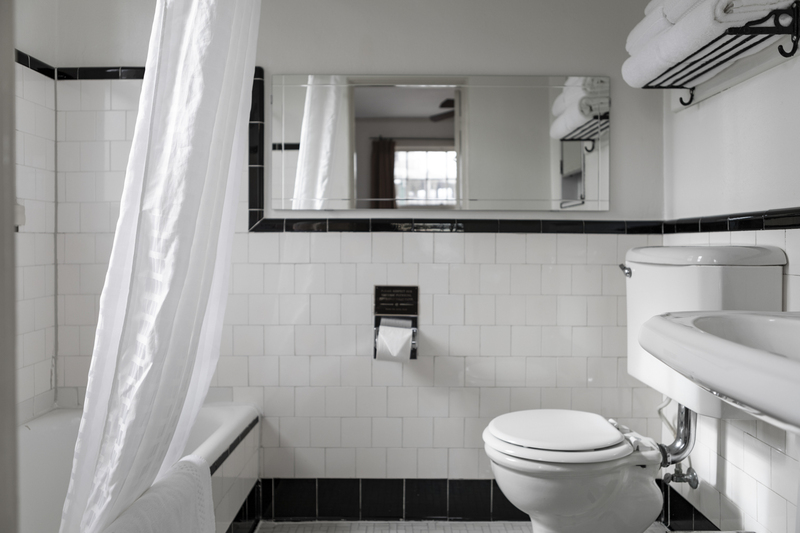 And, unlike most historic hotels, all rooms have private bathrooms and air-conditioning. The Hotel Congress is a member of Historic Hotels of America®, the official program of the National Trust for Historic Preservation for recognizing and celebrating the finest historic hotels across America. We are excited to share that our continued green initiatives have garnered us a new accolade – The Hotel Congress is now a Gold Level Green Leader on Trip Advisor! With our solar powered water heater, stance against abundant plastic usage, composting efforts and determined approach to using local products as often as possible, we are a historic hotel with a passion for the future. Club Rooms: Rooms are directly on top of the night club and are the noisiest hotel rooms in all of Tucson. While the beds do not have coin operated vibrators anymore, these rooms shake and rattle to the bass and bustling street all night long. Cactus Garden Rooms: Interior 1 full bed rooms facing our Cactus Garden Patio. While no room in our hotel could be called quiet, these rooms are a little less noisy and most cozy. Exterior Rooms: Rooms facing Congress St, 5th Ave, or our Plaza. Much louder than our Cactus Garden rooms, but less earthquake-like than our Club Rooms, Exterior Rooms can still be on the noisy side due to street or club noise depending on the day.